The word Peace has invaded Israel over the past months like a flight of dangerous birds from a far-away land. Half the country busies itself with figuring out how to get rid of these pests and the other half wants to learn how to live with them. “Security”—that’s a word everyone knows how to live with, what it looks like, what its absence breeds. But Peace? This is a strange bird. 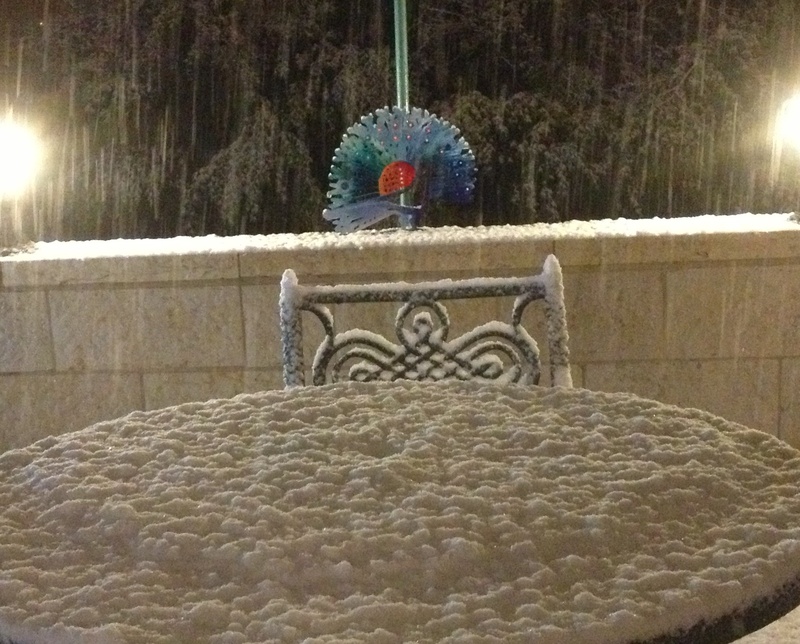 During the snow storm that attacked Israel in mid-December, I had the good fortune to see what Peace looks like. Spending two days in the Emergency Room of Shaare Zedek Hospital in Jerusalem as a “healthy” person accompanying a “sick” person, I witnessed the possible face of a peaceful Jerusalem. Religious symbols and names dangled from necks and name tags from shirts. The men and women racing around with the name tags were the helpers—people like you and me who suffer tzurris, fears and maybe bad dreams at night, but who can function during the day. These helpers were multi-taskers who never lost their focus. They worked as a team and I never heard any shouting, not once, except from a needy woman who was new in the ER and didn’t understand that the helper answering her question as best as she could was also taking care of 30-50 other people with similar questions. The needy woman’s loud outburst did not last long. Someone with a large name tag knew how to calm her. All these helpers had jobs, from the floor washer to the professor, and they all carried out their roles as best they could under the circumstances. The circumstances were the hundreds of needy people who had slipped on the ice in Jerusalem and broken a bone or suffered kidney failure or couldn’t pass urine or a thousand other complications that the human body offers on the cold days, as it does on the hot. The needy were easy to identify: Pain written on their foreheads, an IV stand next to them like a shadow, moans coming from deep in their chests or a scary silence from their depths. Hovering over around and through the bustle were a band of angels. Some wore the uniform of Beit Yaakov high school girls and they offered free sandwiches from Ezer m’Zion. Others were volunteers from all walks of life who gave hot soup even to people like me who were only keeping a needy man company while he waited. A bizarre calm reigned in the bustling room and by the 9th or 10th hour, I realized that this calm in the midst of bustle was what Peace might look like. It was really a marvelous sight to see, this microcosm of what I called Peace. Nobody’s vision of God or two states or one state got in the way. What mattered was the water accumulating in someone’s lungs, the clogged heart, broken wrist, fainting spell, sore knee. Everyone in the ER waited, sometimes for two hours and sometimes for two days. It was that kind of place. You had to wait because there were so many people crowded into such a small space. Either you could kill each other or wait patiently together. There were drugs to help those writhing in pain and once the writhers were Optalginned into feeling no pain, they too waited their turn for a verdict: Go home; take pills; sleep in the ER; wait for CT; advance to Surgery; Hospice. In the ER of the frozen City of Peace everyone waited, some for the angel of death and some for the angelic nurse or doctor who asked kindly what kind of pain it was, how often it came, how long it lasted and then felt the liver or spleen or leg with delicate intentional fingers. During this waiting and watching, I realized that the secret to achieving Peace in this frantic cold piece of geography is to realize we are all needy, wounded and in pain, some more than others, everyone at various times. What unites us all, no matter what language we speak, are bodies that betray us. When I want to relax, I will not return to the ER, but I will go there again when I need hope. I will go back to the room for hope to see people who look so different on the outside, wearing their symbols around their necks, on their heads or under their shirts, sitting together, sharing their stories, supporting each other while waiting. Peace, like a strange bird, is loud as a scream, soft as a moan, crazy and painful as pishing through a plastic tube. Peace hurts. But Peace is the only cure for what ails us. This entry was posted in Israel, Jerusalem and tagged City of Peace, ER, Shaare Zedek. Bookmark the permalink. This is beautifully written and a vision of Peace that resonates with me– thank you! Thanks, Jane. Maybe when it comes, you’ll come visit. Always god to hear from Judith, no matter where you are. There will be a good class with a visiting writer, Michael Golding, June 5-6 and another one July 12-13 with Fred Leebron. I plan to be here all summer, so whenever you come, *brucha ha’ba’aa*. How true that it is the common experiences of inclement weather and physical ailment that cut through our differences and unite us as human beings. Hope everyone is well. Maybe only an earthquake will make everyone see this . . . . Excellent picture of the world we want to share with our neighbors, Judy! >>..This is beautifully written. I would hope it could get submitted to a large American publication. It’s a world the general population doesn’t see. If you’re sick, you’re not focused on it, if you’re working in the setting you’re very focused and busy attending to everyone, it takes a bit of an outsider so to speak to look around and process all that is going on. You articulated thoughts I’ve had during visits to the Hadassah hospitals, and which I’ve spoken about with Shoshana. And you conveyed the idea with eloquence. I loved the phrase, “an IV stand next to them like a shadow” and the way you described the mix of people and their symbols. Your essay shows that we humans are resilient enough to sustain pain when faced with mutual honor and respect, grace and patience. Hi – This is a fine peace. I often think that the peace talks should be held in a hospital where people relate to one another as human beings. I loved the optalginned. – I could imagine a gin in that cocktail. Inshallah a piece of peace will happen here. What a fabulous idea, Diane- to hold peace talks in a hospital. Tell Kerry.